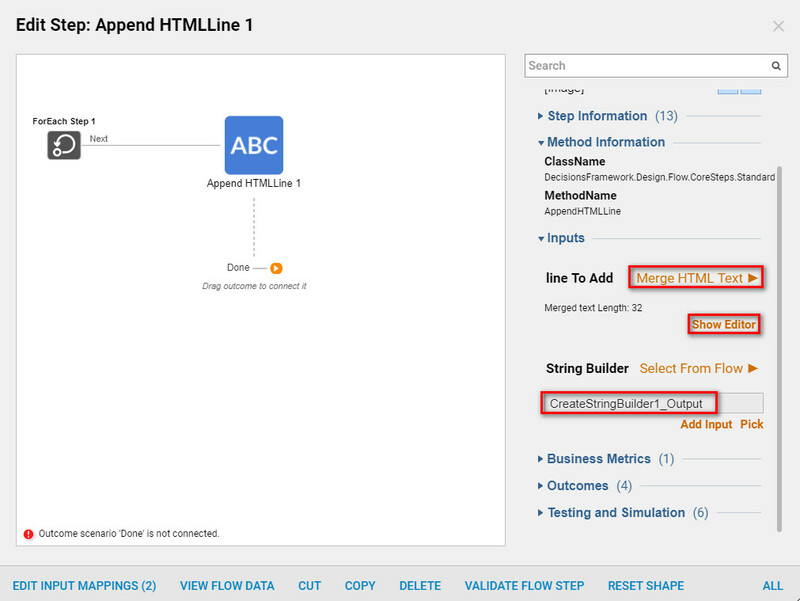 Appending HTML Lines using a String Builder Step requires a few steps to get the data from the database and then select the information needed to Append an HTML line into Text. The String Builder Steps are found in the Steps Tab under Data> Text> Builder. 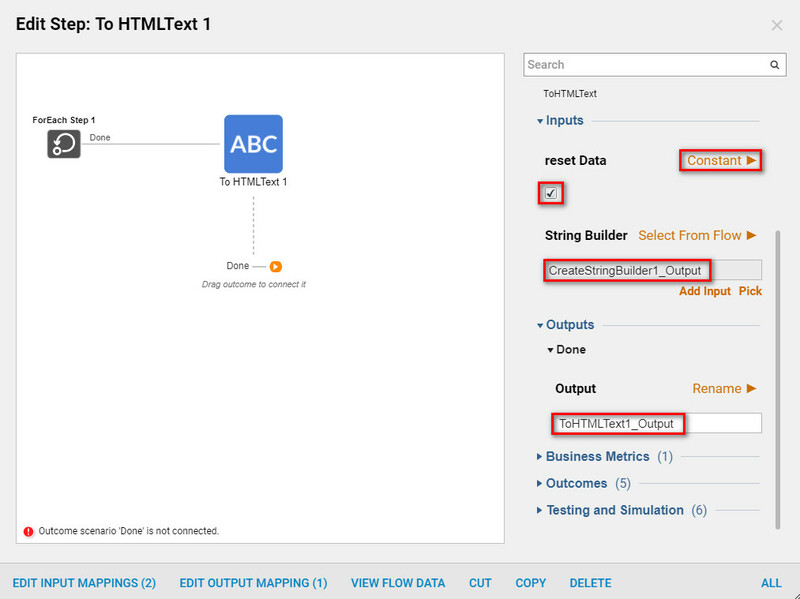 The flow example below demonstrates how to append HTML lines to the String Builder. The steps used in the flow example are listed below. In the Create String Builder Step	s editor under Outputs	set the Done	path to Rename	and enter CreateStringBuilder_Output. 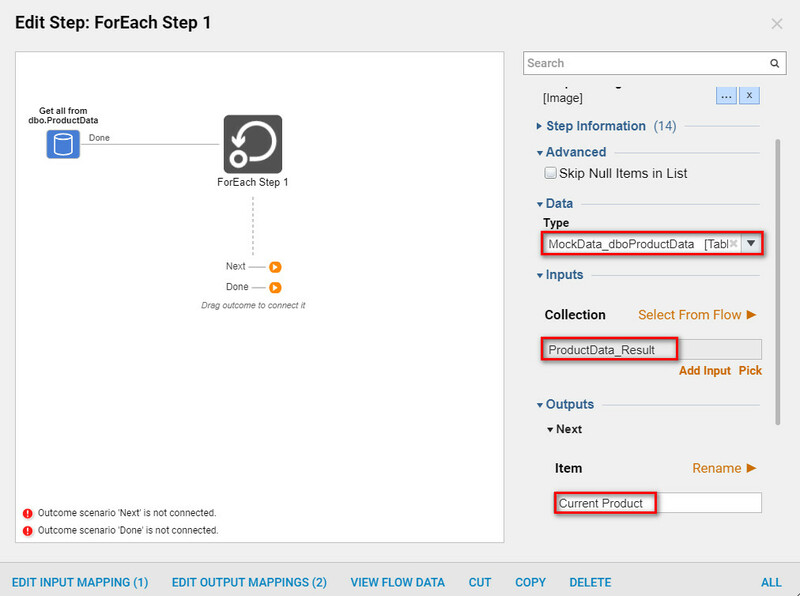 Note:	This step is populating data from an integrated database. It is not necessary to integrate with a database, this step should be replaced with the relevant data for your process. 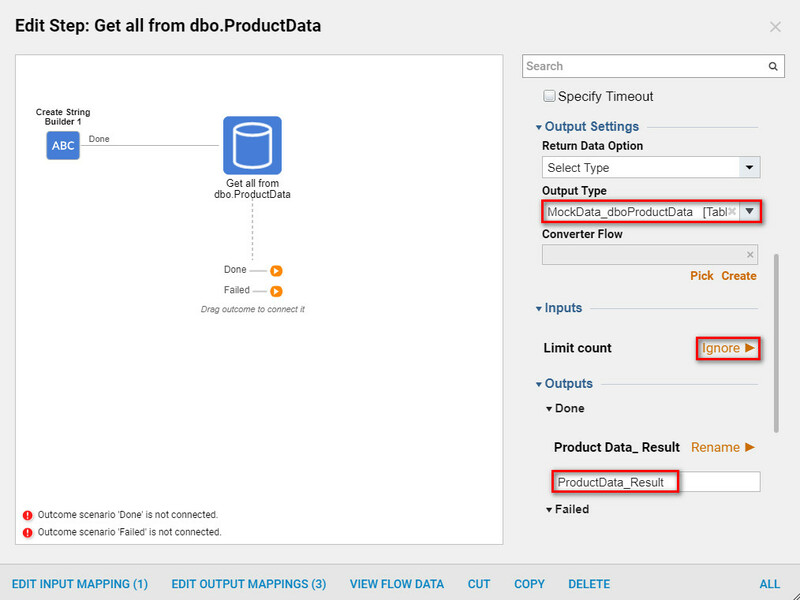 In the Get all from dbo.ProductData	the Table will appear under Output Settings	and under Output Type. Under Inputs	set the Limit count	to Ignore	or specify the Input. 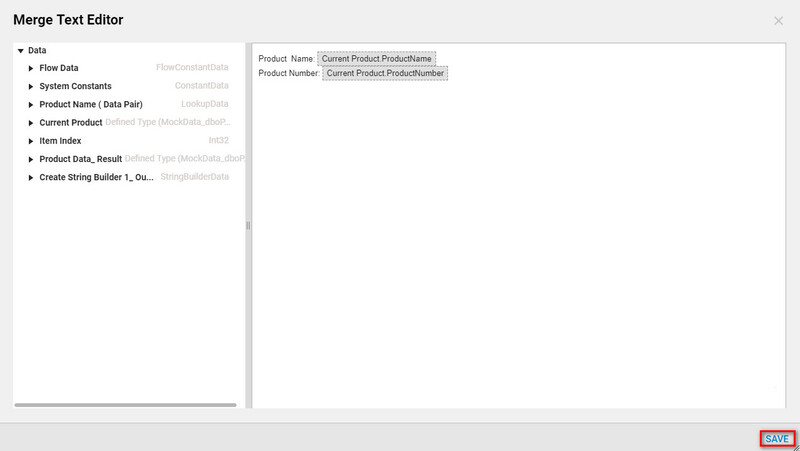 Under Outputs	and Done	select the data, set to ProductData_Result. In theForeach Step Editor	, select the Data Type	and select the collection outcome under Collection. Under Common Properties	and underData	select the database that Decisions has been integrated with (Mock Data). Next, underInputs	and Collection	choose Select From Flow	and then pickProducts_Result outcome. In the Append HTML Line	editor underInputs	next to line To Add	select Merge HTML Text	and select Show Editor	to add the inputs. 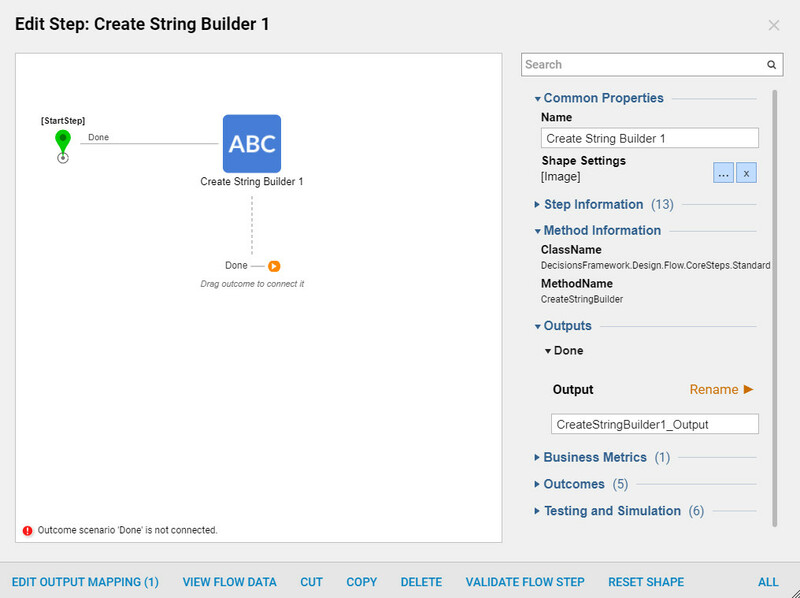 Next, to String Builder	choose Select From Flow	and select the CreatStringBuilder_Output. Show Editor:	SelectShow editor	to open the Merge Text Editor	. Create anHTML text	using flow inputs on the left. Select the data from the database that you want to be displayed. Selected below is Current ProductName	and Current Product ProductNumber. In the HTML Text editor	under Inputs next to reset Data	select Constant	and check the box. Next to String Builder	set toSelect From Flow	and then Pick CreateStringBuilder_Output. After theSteps	are configured in theProperties Tab underCommon Properties	, connect the pathways as displayed. Complete the flow by selecting Debug and verify that the flow works properly.